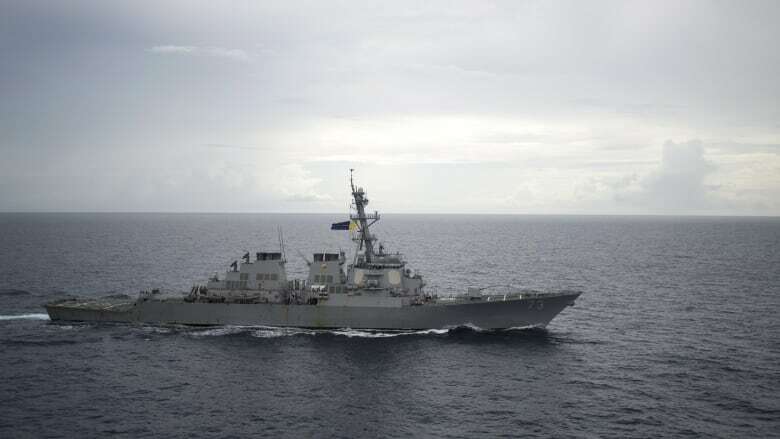 A Chinese destroyer came aggressively close to a U.S. navy ship in the South China Sea, forcing it to manoeuvre to prevent a collision, the U.S. Pacific Fleet said Tuesday, describing an encounter that could worsen tensions between the countries. The Chinese warship approached the USS Decatur in an "unsafe and unprofessional manoeuvre" on Sunday near Gaven Reefs in the South China Sea, said Lt.-Cmdr. Tim Gorman, spokesperson for U.S. Pacific Fleet. The Chinese destroyer "conducted a series of increasingly aggressive manoeuvres accompanied by warnings for Decatur to depart the area," Gorman said in an emailed statement. It approached within 41 metres of the Decatur's bow, forcing it to manoeuvre, Gorman said. The Chinese Defence ministry said Tuesday it opposes the U.S. warship's entry into the waters "around China's islands and reefs." It confirmed that the Luoyang, a Chinese missile destroyer, was immediately deployed to identify the U.S. warship and drive it away. The Chinese Foreign Ministry said it strongly urged the U.S. to stop its "provocative" actions. Beijing said the U.S. had no right to interfere in Chinese military co-operation with Russia. In response to the sanctions, China summoned the American ambassador and defence attache to deliver a protest, and recalled its navy commander from a U.S. trip. Plans for U.S. Defence Secretary Jim Mattis to visit China in October for talks were scrapped in recent days, with conflicting reports as to who cancelled them.